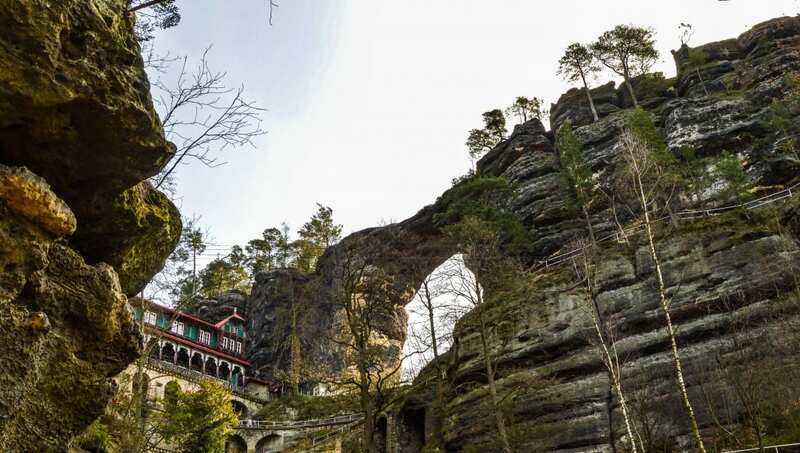 If you are looking for an active day trip from Prague look no further than Bohemian Switzerland National Park. There are many reasons to visit the capital of the Czech Republic, many of them well documented. And there are just as many reasons to take a day trip from Prague. 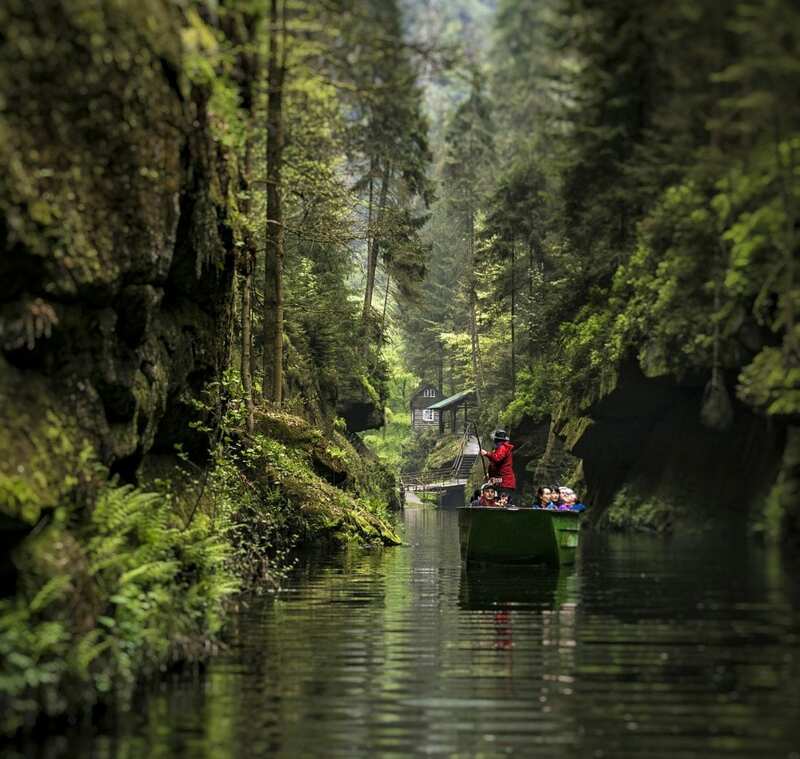 And …you guessed it…Bohemian Switzerland national park is one of those reasons. This sprawling national park is just a 90 minute drive from Prague, but it may as well be on a different planet. You will find no trace of city life here. 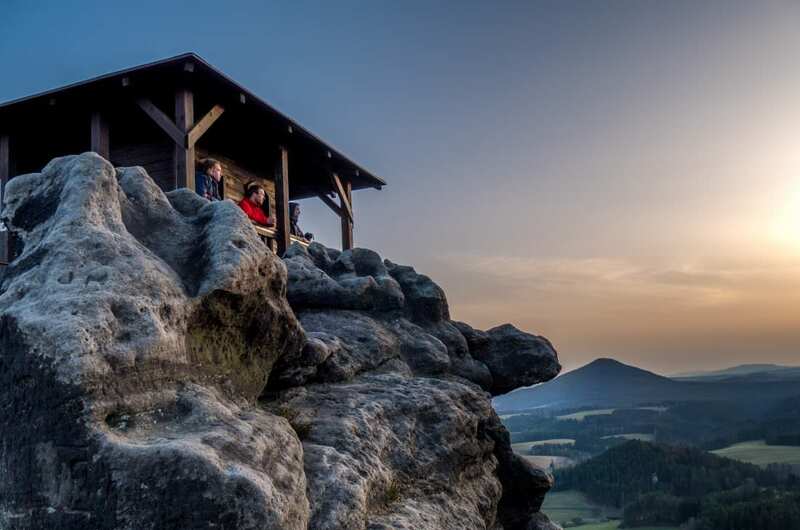 Home to verdant gulches, towering sandstone cliffs, peaceful swaths of farmland, quaint little villages, and majestic rock formations Bohemian Switzerland is a delight for all outdoor enthusiasts. Let’s quickly address the sandstone elephant in the room. Bohemian Switzerland is NOT actually in Switzerland. It is a region in the north of the Czech Republic, or Czechia as the country is now being called by some. “Well then, what’s up with the misleading name?”, you might ask. It’s a simple matter, really. At some point in the 1800’s two Swiss artists decided that a particular area in the north of the Bohemian Kingdom (now the Czech Republic) reminded them of their home country. They were sort of popular (tons of Twitter followers and such), and thus the name was born. The first thought that comes to most people’s minds when the Czech Republic is mentioned is Prague. Which is totally understandable, as Prague is iconic, and gorgeous. We lived in Prague for seven incredible months, and we are counting down the days until we are lucky enough to do so again. But…if Prague is the extent of what you see when you visit the Czech Republic you are truly missing out on some spectacular locations. 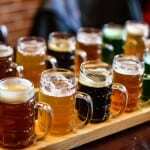 The fairy tale town of Cesky Krumlov, the birthplace of Pilsen beer Plzen, the spas of Karlovy Vary, and so much more. In fact, there are so many that we can’t stop writing articles about them. Make sure to check out our current list of the best day trips from Prague. So when you come to Prague you should absolutely make time to visit other locations. 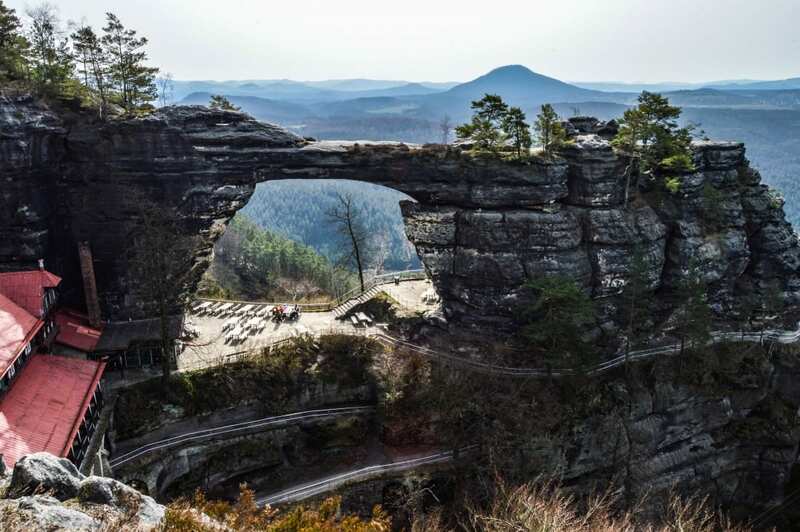 If you are a fan of the outdoors, if you want to experience some incredible hiking or biking, then you need to go to Bohemian Switzerland. Looking for a hotel or hostel? Here is our guide to the best places to stay in Prague! 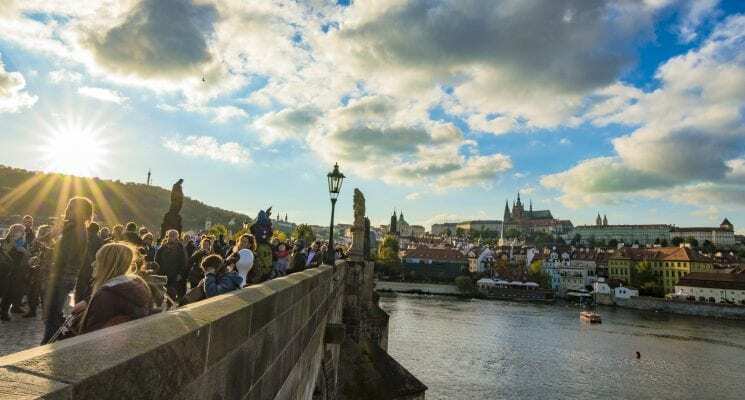 Have a look at our guide to getting off the beaten path in Prague! 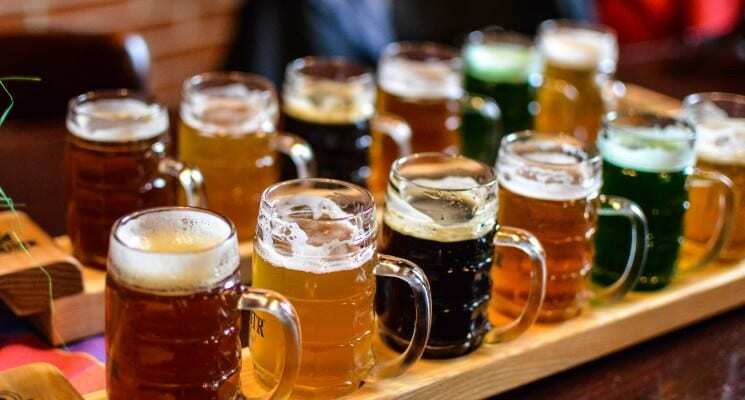 Party the night away with our guide to Prague’s nightlife! Eat amazing food at these great restaurants in Prague! 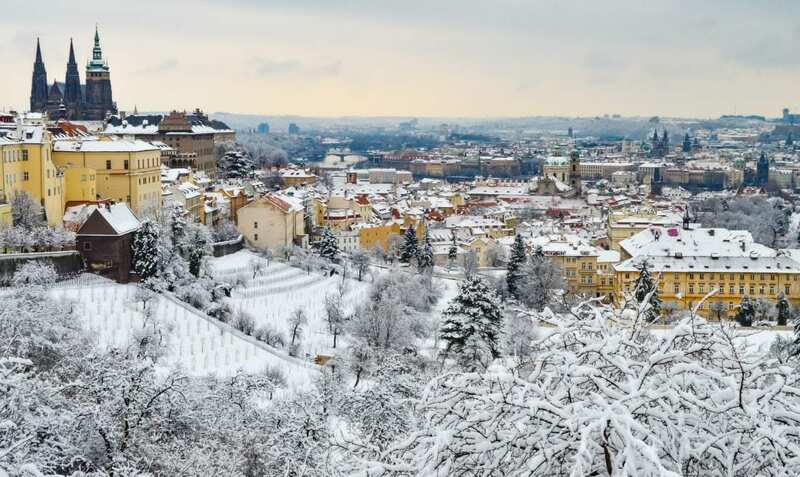 Finally, our guide on which season to visit Prague and the Czech Republic during! Our own Bohemian adventure took place over an all too brief weekend in early spring. We had spent what seemed to be a long (yet still beautiful) winter in Prague so it was a huge thrill to get outdoors and explore a bit of the Czech countryside. We were treated to two full days of hiking and gallivanting around Bohemian Switzerland by the really cool guys at Northern Hikes. This won’t be the last time we mentioned them, as they really pulled out the stops to share their passion for Bohemian Switzerland with us. The first stop on our Bohemian excursion were the Gorges of Kamenice, a deep and narrow mossy valley carved out of sandstone. The gentle hiking trail down in the gorge meanders alongside the banks of the lazy river, as moss and lichen coat the towering grey rock with verdant fuzz. Most of the trail can be hiked on foot, aside from two areas through which only a river boat can go. And so on a river boat we went. The pole boats glided over the dark shallow waters, taking us for a short ride through narrow passes between grey-green lichen crusted slabs of rock. The eco-system that evolved down in the gulch felt secretive and primal, old from a time before anything that resembled man walked this earth. The gully teems with life; a fragrant lushness that makes you want to take a deep breath, and perhaps just sink into the stone. There is a stillness within those so-green-they-don’t-look-real rocky walls, and a permeating sense of ancient wisdom. “Follow the emerald trail, listen to the river, and all will be revealed, child” the gorges seemed to say. It was easy to fall under the pacifying spell of the river and its companions; the setting is seductive in its tranquility. In an ideal world we’d start many Saturday mornings with a gentle contemplative hike among the stillness of the Gorges of Kamenice. This was but our first stop on that particular Saturday, and Bohemian Switzerland had only just begun to reveal her secrets. We hiked out of the gorge and stopped by the “U Forta” restaurant/hotel, one of only two such establishments within walking distance…within walking distance from the main trails in the park. 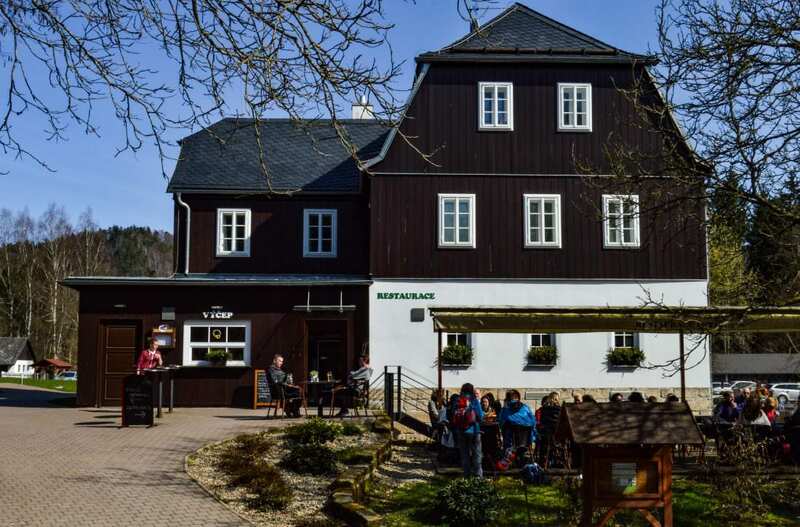 U Forta serves an assortment of traditional Czech dishes, and many tasty beverages for hikers, bikers, and explorers to happily consume. They even managed to arrange a vegan dish, which is a trend that we hope will gain traction in the Czech country side. High above the Bohemian countryside, built atop the ruins of an old castle, sits Saunstejn. In order to gain this commanding view of the breathtaking landscape one must brave a series of steep stairs and metal ladders. Ascending to the pinnacle rewards you with a spectacular vista that can stretch for miles on a clear day. So we climbed it, of course. Local legend has it that after the castle, which was built to protect merchants on the long road between centers of civilization, fell into disrepair centuries ago it was taken over by bandits. These fearsome outlaws used the ruins as a base of operations, plundering the very caravans the castle was once built to protect. We can not attest to the validity of this particular piece of lore, mind you. But the feeling of standing atop of Saunstejn, which is already quite the experience, is made all the more sweet by the thought of it. To bask in a sunset on our first day exploring, Northern Hikes took us to Mary’s Rock, a lookout point very few visitors ever find. Once a watchtower used to spot forest fires Mariina Skala is now where local lovers, poets, and photographers go to bid farewell to the setting sun. The hike up to Mary’s is pretty strenuous, although it does not require the sort of vertical climbing the Bandit’s Keep did. The views are well worth the effort, presenting anyone who undertakes the task brilliant vistas and the potential for lovely sunsets. We bid farewell to the sun from our vantage point high above the countryside, and then made a slow return back down for a dinner and a much deserved beer. Gabriela’s trail begins at the steps of the U Forta hotel mentioned above, and meanders through a green conifer forest before gently climbing up into sandstone mountains. 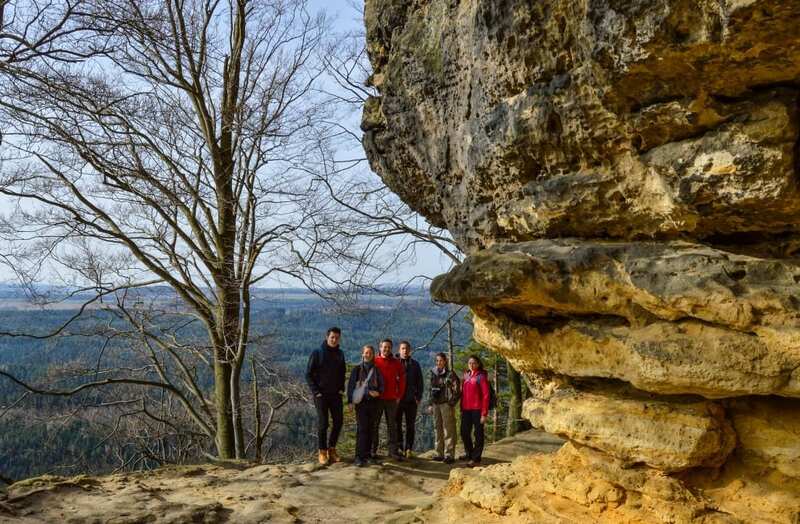 It offers hikers of all ages an up close and personal acquaintance with the sandstone formations that form the skeleton of the Bohemian Switzerland national park. 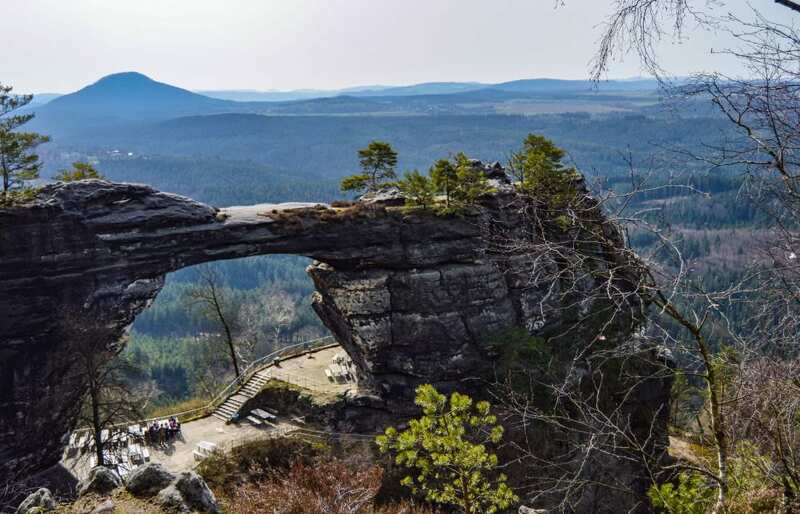 Pravcicka Gate is undoubtedly the most photographed location in Bohemian Switzerland, and with good reason. Just look at it. It’s huge. The majestic sandstone arch is the largest of its kind in Europe and among the grandest in the world. Towering 16 meters (52 feet) into the air, the arch has a uniquely wide top, giving it the look of a sturdy bridge. The hiking continued, and we gained access to the cliff top near Pravcicka Gate, allowing the arch to be viewed from above. It’s as stunning from above as it is intimidating from below, a truly exceptional bit of sculpting work by mother nature. The cliff opposite the arch also rewarded us with additional sweeping vista views. More lush Czech country side, and a peak into Germany whose order is only about a kilometer away. Hiking can be a thirsty business, so we rested our feet and had a couple of beers at the Falcon’s Nest, a hotel constructed in the 19th century. 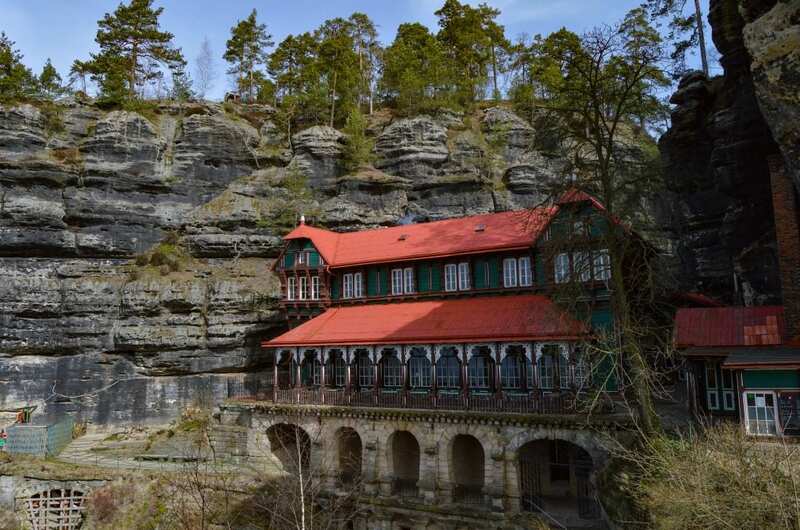 Fittingly this impressive structure is built in a very architectural Swiss style, making it the most Swiss thing about Bohemian Switzerland! 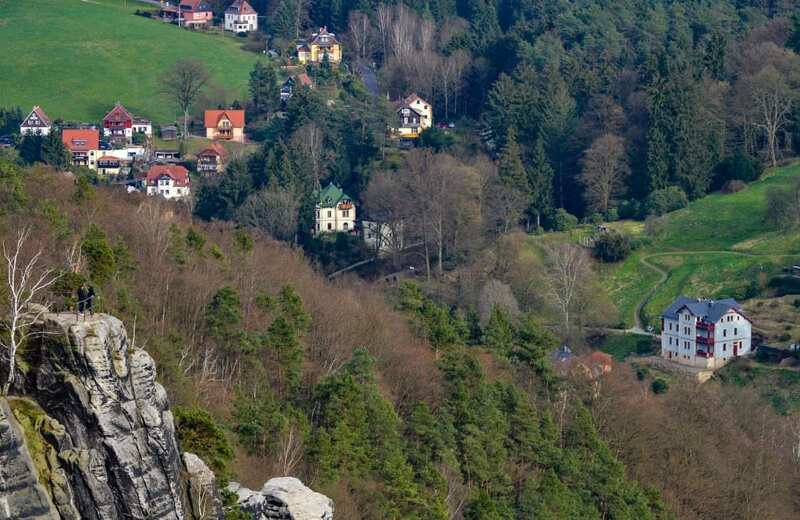 Laying adjacent to Bohemian Switzerland, Saxon Switzerland National Park is located right across the German border. 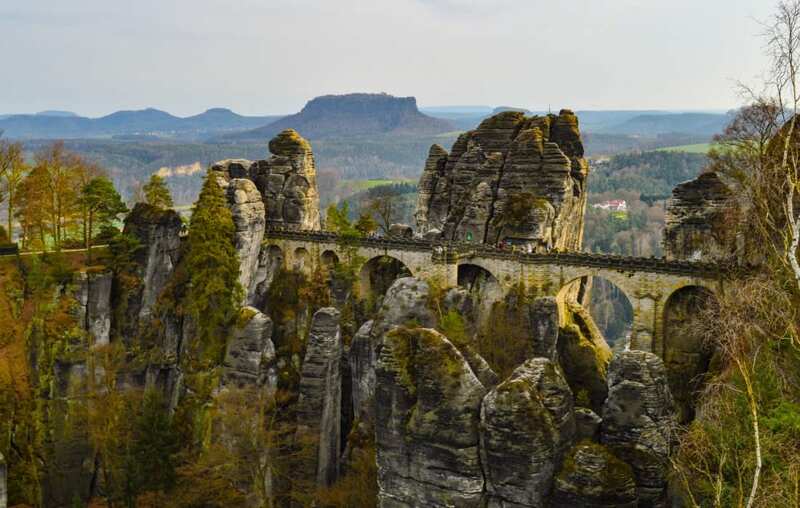 The Bastei Bridge, as seen above, was built in 1851, and links several massive rock formations together. It served no defensive or commercial purpose, and existed solely for people to bask in the intimidating beauty of the region. Not much was done with tourism in mind back in those days, making this stunning bridge ahead of its time. The bridge itself is impressive, and Bastei offers some truly spectacular look-out points of the surrounding park and river. It made for a fitting last stop in our exploration of the region. We normally dislike tours and planned trips, preferring to explore any given town, city, or region at our own pace. When we DO opt in for a tour we do so with a local guide, and with a locally owned business. A tour needs a passionate guide to truly be worth our time. Which is why we are thrilled to recommend Northern Hikes to any of our readers who want an organized hiking trip to Bohemian Switzerland. Northern Hikes is a small, local Czech company founded by Vit Slezak. 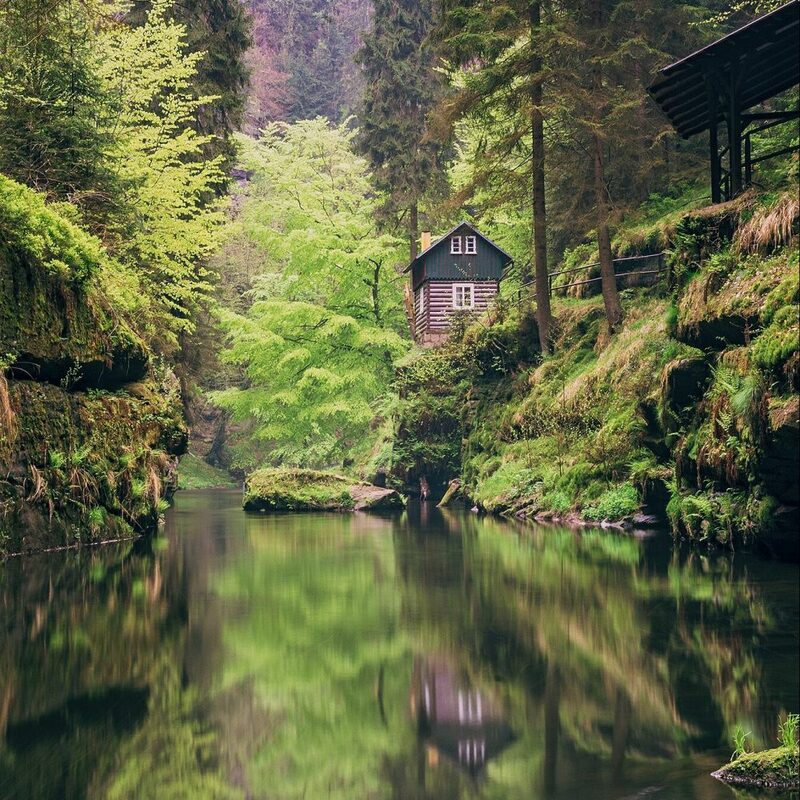 Vit was born and raised in the town of Decin, and has spent nearly 21 years exploring Bohemian Switzerland National Park. 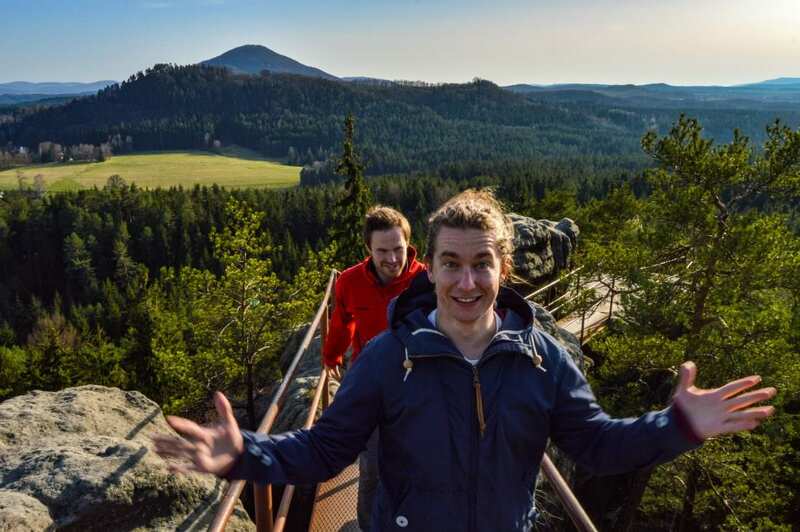 Tired with his meaningless corporate job Vit founded Northern Tours with a mission statement aimed at enriching the experience of people visiting the Czech Republic by introducing them to the beauty of the region he grew up in. His energy and passion for Bohemian Switzerland is readily on display, and we are hard-pressed to think of a better guide for our own trip. Vit (back) and Tomas of Northern Hikes. Want to see more of the stunning national park? 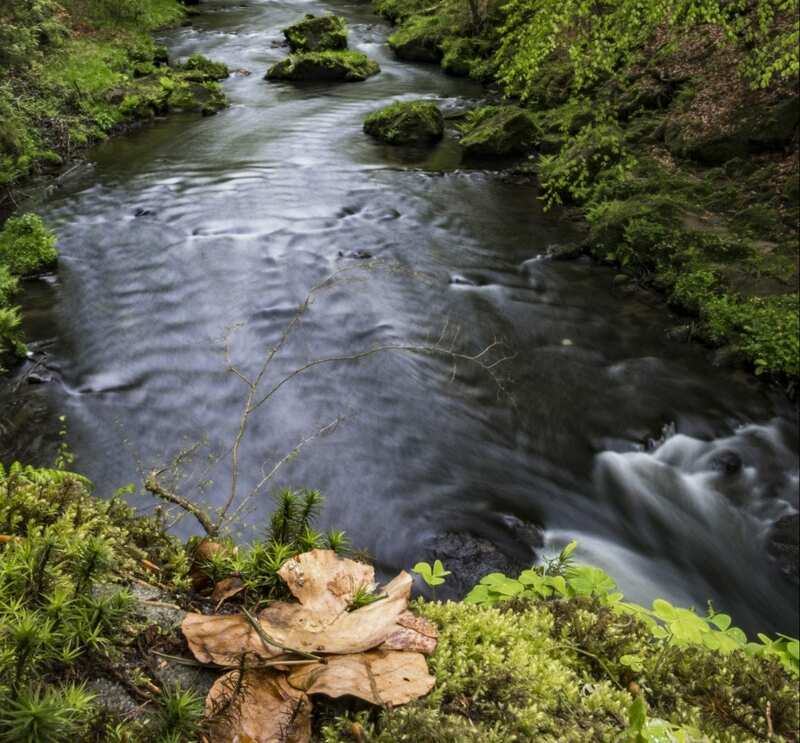 Here is a video our friend Hynek Hampl shot during our trip to Bohemian Switzerland. 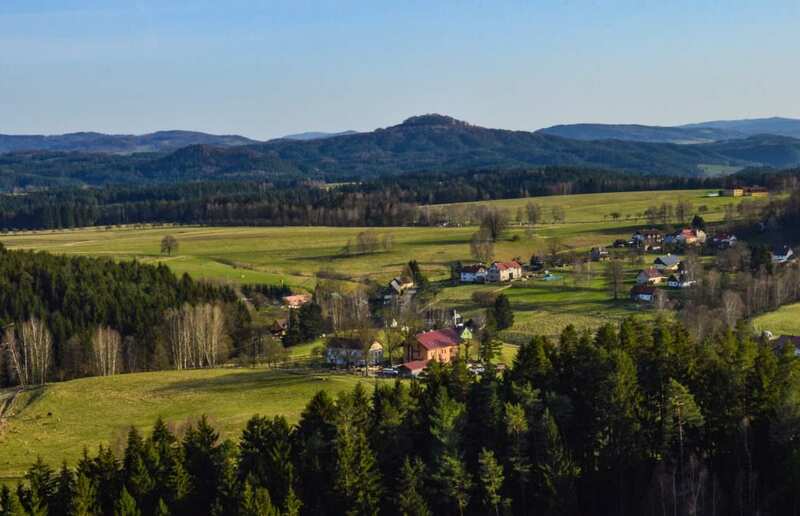 Getting to Bohemian Switzerland from Prague using public transit isn’t the most simple thing to do but it is possible. The best way to get there is to take a train to Decin which takes about 90 minutes. You can then transfer to a bus heading to Hrensko and begin your hike from there. 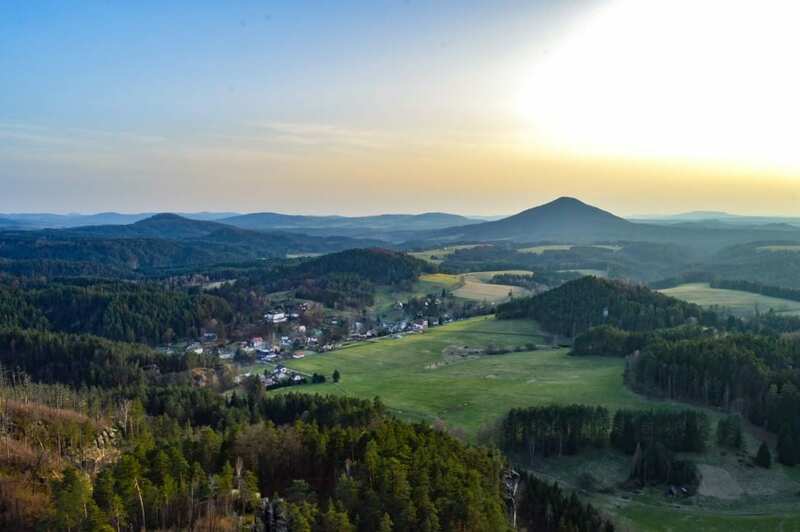 For visitors who don’t have time or the willingness to visit Bohemian Switzerland using public transit you can rent a car and reach it in less than two hours rent a car. 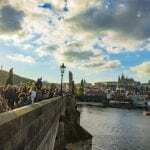 Click here for a list of all of our Prague travel guides and articles! Note: Special thanks to the Northern Hikes who hosted us and organized our trip. As always, all opinions expressed are 100% our own. Holy moly, what a beautiful place! I just got back from Vienna and Prague, and I’m already itching to go back to the Czech Republic to venture further afield. We did visit Plzen but just didn’t have enough time to go anywhere else. This is on my list for sure. Thanks for sharing! Kelly, thank you for the comments. The Czech Republic has so much beauty to offer and we’ve been very lucky to be able to see some of it. 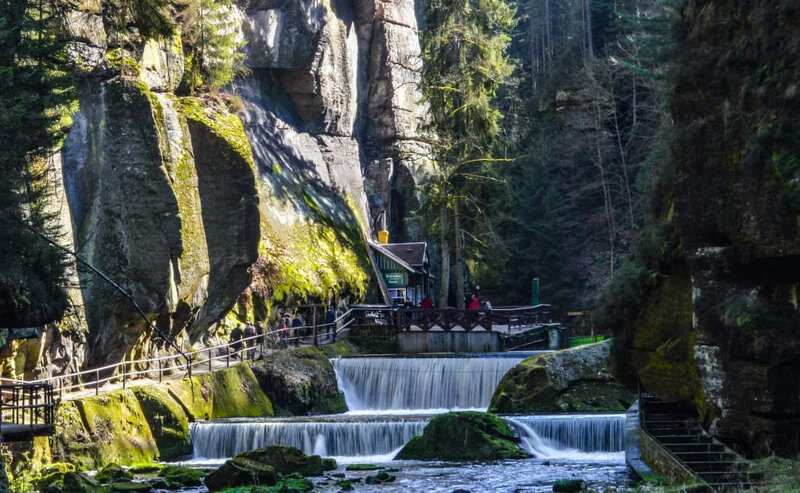 I have no doubt that when you visit Bohemian Switzerland you will love it as much as we did. I hope you are able to visit again soon. Wow, Bohemian Switzerland is absolutely stunning. Your photos of Kamenice in particular caught my eye. I spent two weeks in Czechia (hehe) last November but I keep finding more and more that I need to see. Awesome stuff. Hi David, where in Czechia did you visit? We are putting out an article about places to explore for a day or two while in Prague, and would love to know what you enjoyed while here! In Bohemia I visited Cesky Krumlov for the old town; Plzen for the beer; the small town of Loket near Karlovy Vary which has a cool castle and some interesting folklore (meteorites, dragons etc. ); Prague with a day trip to Sedlec and Kutna Hora for the Ossuary (Chapel decorated with bones and skulls). I’ve heard good things about Karlstejn Castle too. Then over to Moravia with Brno and Olomouc which both had some interesting castles and churches and strong student vibes. I quite liked Olomouc, they had the first night of their Christmas Markets while I was there. Great article, fantastic pics and awesome video… Pravcicka Brana has always been on my to do list in CR, thanks for reconfirming how beautiful it is. Hi! Quick question, are you allowed to Hike the areas of Bohemian Switzerland are yourself without a tour guide? I wanted to go to Pravcicka Brana – Pravcicka Gate, and the Soutěsky Kamenice – The Gorges of Kamenice. Hi. I am planning to go there this weekend. What month of the year did you do the hike in the photos? Can we go for the guided tour with a 3 year old kid. ( We have another 10 year old. Would you say it is possible to do this excursion with a rental car and no tour booked? Hi Nitz,yes it is possible. It won’t be the same experience as you get when local experts are showing you around but it’s doable. Also, just know that many of the people in the region don’t speak English, but only Czech or German. So that will be a bit of a challenge. 🙂 Hope you enjoy the trip! It really is an amazing place to visit. Hi,Minimum,how many days do i need to visit the Czechia.I am mainly interested in Landscpe.Also what time i should plan the trip to get a nice weather and best of Nature. It is possible to go there without tour? How long does it takes to hike there and see it all? We had a phenomenal experience with Northern Hikes. Too bad more Prague visitors don’t venture to this part of Czechia. Kicking myself for not knowing about this place when I visited Czech Republic few months ago. Time to plan another trip here. Make sure to have a look at all the other day drips from Prague we recommend! It will make your next visit so much cooler! Hi- this sounds fantastic and is titled “a day trip from Prague” but while reading, it sounds like it was two days or am I mistaken? 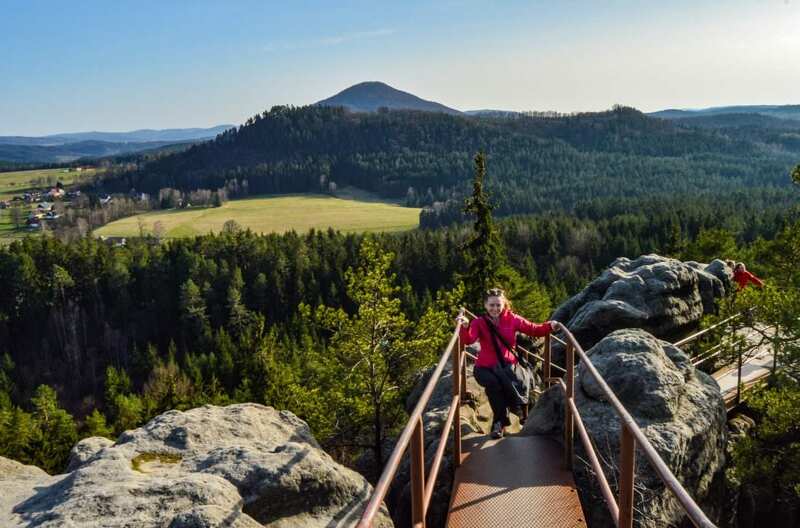 Kathy, you can visit Bohemian Switzerland as a day trip, or as a multi-day experience. We visited for a few days, but there are companies that offer a day trip package. You can also easily reach B.S. if you have your own car, as it is about a 2 hour drive from Prague’s center. Of course, in the winter, the days are shorter and you will see less than you would in summer, so keep that in mind.